This group will be a place to discuss, plan, and sew patterns, using a variety of heirloom sewing and embroidery techniques. Come ready to discuss the heirloom and embroidery “potential” that various patterns offer, and prepare to share these lovely creations as they are completed. I didn’t end up doing the embroidery, thought it would get too busy. But thank you so much for your detailed explanation. Will definitely use on next one. I have this pattern and even though I haven’t actually finished one, it is a perfect pattern to use embroidery with. I am fairly experienced when it comes to embroidery, having just brought out some smocked dresses to fit my youngest daughter that I made my eldest daughter twelve years ago. Agreed! I have to go back and search for that sailboat top… But yes you certainly are correct, who knew that pockets would be perfect to smock on? Gathering gives the clue. And of course there are more than just the counterchange and geometric/ English smocking. I haven’t yet tried using ribbon but want to one day. I have added smocking to the bubble shorts, the garden party dress,tje fairy tale dress, and the sailboat top. I am working on a smocked popover dress as well. I think anything really could have a bit of smocking added to it. 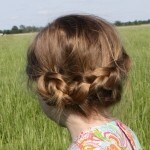 @sewgirl23 if you look at the line of the style of garment, it will give you an indication of where the smocking can go. I have used smocking on the carousel dress, the school photo dress and the school days jacket, not to mention the croquet dress. I think the 2+2 would be gorgeous. Just under the tie, instead of the tab. ASM Blue did a gorgeous Ice Cream blouse. I would use gingham, so I could stitch the squares, rather then pleat. I still love French knots. I think simple smocking looks cleaner and more modern. @motherof5 I’ve always wanted to get into smocking, and am just trying to figure out which patterns I could adapt to have a bit of a smocked motif! 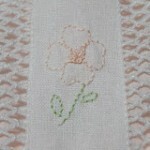 I did so much embroidery in the 80’s and 90’s, I’m the same way when I see fine needlework. Thanks Tamara, I think will go with the kit! @jay_1965vw it is just the kit as the pattern is sold separately so it wouldn’t be cut out. Raglans generally allow a bit more room – like bishop dresses. But I like that thought on the seams, although I am not sure what allowance they would have, I am assuming it would be enough to allow for french seams. @justsewit No, she’s just on 9 weeks, but she’s BIG! She’s just under the 97th percentile, and projecting her growth on the graph in her MACH book, she’ll be 19lb by September (the patterns mostly seem to measure in pounds, so that’s how I worked it out). Yes! Old fashioned baby are really lovely, based on real antiques. That one has it’s own individual charm and I found the patterns roomy so because she looks like a scrumptious cuddly darling, it should be perfect!